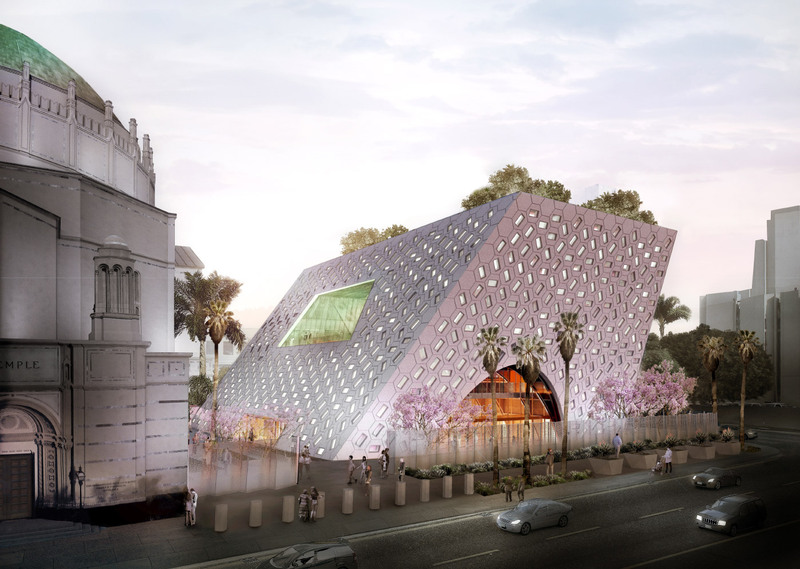 OMA’s first cultural building for California has been revealed, as the firm provided a first look at the forthcoming Audrey Irmas Pavilion in Los Angeles, a cultural center for the neighboring Wilshire Boulevard Temple. OMA New York was commissioned for the project after winning a design contest in 2015, and the completed cultural center will sit next to, and dialogue with, L.A.'s oldest synagogue. The historic Wilshire Boulevard Temple was built in 1929 in the Byzantine-Revival style, and deference to the institution informed the Audrey Irmas Pavilion’s design. The serious slope on the building’s west façade will push it away from the existing temple, while it also leans south and away from a historic school. Located on an intersection, the dramatic forces that influenced the building’s orientation have also resulted in the pavilion “reaching out” to Wilshire Boulevard. “We wanted to focus on communicating the energy of gathering and exchange,” said lead designer Shohei Shigematsu in a statement. 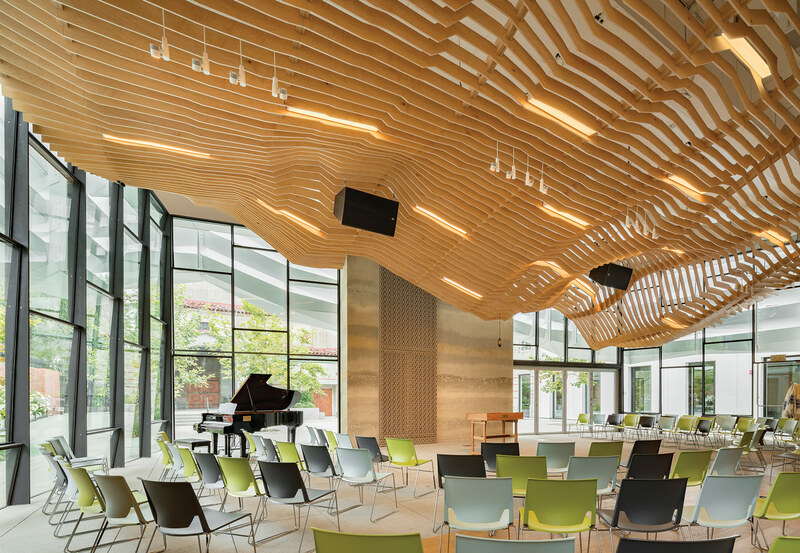 “The pavilion is an active gesture, shaped by respectful moves away from the surrounding historic buildings, reaching out onto Wilshire Boulevard to create a new presence. Within the building, a series of interconnected meeting spaces at multiple scales provide ultimate flexibility for assembly while maintaining visual connections that establish outdoor indoor porosity and moments of surprise encounters.” The pavilion will hold three distinct gathering spaces throughout, including a main event space, smaller multi-purpose room, and a sunken garden. Each of the interior spaces will be stacked vertically and arranged to give visitors specifically framed views, while remaining interlinked. The scattered openings across the pavilion’s hexagonal façade are meant to filter light to each gathering space while also reorienting guests to the rest of the campus. “Audrey Irmas Pavilion, designed by OMA—the firm’s first cultural building in California—will offer an irresistible invitation to gather, celebrate, learn and reach out to others,” said Rabbi Steve Leder in a statement. “In a city so large and diverse, we need community, and we need inspiring, welcoming places. Los Angeles deserves a modern masterpiece devoted to bringing people together, located in the heart of the city’s most diverse neighborhood. We are very proud that Wilshire Boulevard Temple will be a vital part of a cultural, religious and socially conscious conversation that is defining 21st Century Los Angeles.” The Audrey Irmas Pavilion is named after philanthropist Audrey Irmas, who spearheaded the capital campaign for the project in 2015 with a $30 million donation. The L.A.-based Studio-MLA will be serving as the project's landscape architect, while Gruen Associates are cited as the executive architect. OMA expects to break ground on the center this year, with plans to open in 2020.